The famous Holsten Brewery in Hamburg, Germany was founded in 1879. 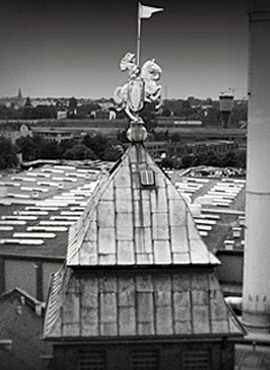 The Holsten knight on his steed guarded over the brewery from the rooftop for over 130 years. The best known Holsten beer is its classic Holsten Pilsener, a refreshing pure German pilsener that is enjoyed throughout Europe and the UK. Now you can enjoy true German pilsener flavour in a zero-alcohol beer, with Holsten 0.0%. Where does the Holsten name come from? Once upon a time a Germanic tribe called the “Holsten” lived in northern Germany in the region that is now called Holstein. According to the “Chronica Slavorum”, written in the 12th century, the Holsten were described as a freedom-loving, bull-headed and very hospitable people. Perhaps the founders of the Holsten-Brauerei AG had these characteristics in mind when they christened their brewery in 1879.